Woo-hoo! This was a great week for me! My goal for the week was to give up sugary drinks and only drink water! I will admit the first two days were pure torture! The headaches I got from caffeine withdraw were horrible. But, I stuck it out and I have not had anything to drink but water since last Wednesday! Yay for me! Our task this week is to list some blogs or websites that are helping with our weight loss journey. The site I like to use is Diet.com. This site is full of info and recipes. My goal for this week is to make better snack choices and to keep drinking only water. YAY! YOu did such a great job! Good Luck this week! This week... I vow to give up... salty things. (my ankles will rejoice). Great job! Thanks for inspiring! Alright Sandy!! Soon, you will no longer have the urge for pop. I am only allowing myself pop on special occasions. I am also thinking of the money I am saving from not buying pop. You are so cool to fill up my following widget thingy! Great job Sandy! I love your blog!! I LOVE me some water--it's my drink of choice. I have been drinking 88oz. a day so all I do is drink water and pee!! Congrats! I know how hard that is, esp. once those caffeine headaches hit...they are pure torture! Good luck this week with your snack choices. :o) Happy Thursday! 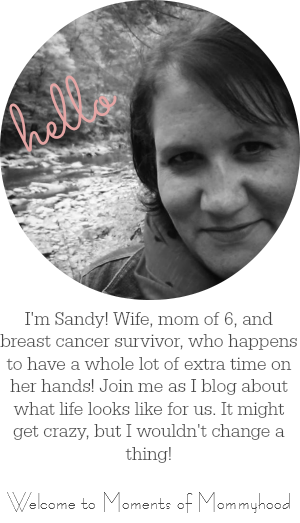 Hey sandy, thanks for encouragement on my blog! I came over to encourage you right back. That is a HUGE deal to cut out sugary drinks and go to water. And I find diet drinks are not a good substitute, because they still keep you dehydrated, and ther are all kinds of studies that show people who drink diet soda are more likely to be overweight than people who drink regular soda! What an irony! Way to go! Another drink option is decaf iced tea...low cal if you don't add any sugar. Holy WoW! Only water! You go girlie! Good for you!! Water is the way to go! Keep up the awesome work pal! Now if you could harass me a little? I have my coffee in the am and then next thing I know it's time for bed and I haven't had ANYTHING to drink all day! Sooooo proud of you!! Great job!! I get many dessert/snack items from www.dietdirect.com They are awesome!! !